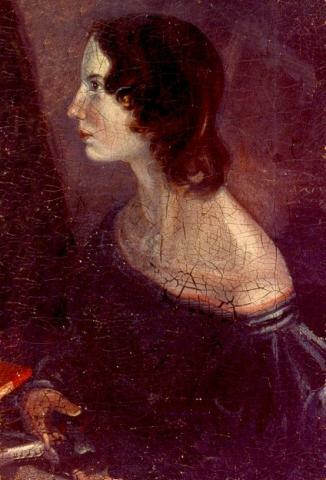 In 1847, after the success of her sister Charlotte's novel Jane Eyre, Emily Bronte published Wuthering Heights. The tale takes its name from the farmhouse on the bleak and windy North York Moors where much of the story is set. In it, we read of a passionate love affair between Catherine Earnshaw and an orphan adopted by her father by the name of Heathcliff. The book challenged Victorian ideals such as gender inequality and class differences as well as general morality and religious hypocrisy. As relevant today as it was when first written, the story is considered a classic of English Literature. Emily Jane Brontë (pronEng|ˈbrɒnti); (July 30, 1818 – December 19, 1848) was a British novelist and poet, now best remembered for her only novel "Wuthering Heights", a classic of English literature. Emily was the second eldest of the three surviving Brontë sisters, being younger than Charlotte and older than Anne. She published under the masculine pen name Ellis Bell. Emily Brontë was born in Thornton, near Bradford in Yorkshire to Patrick Brontë and Maria Branwell. She was the younger sister of Charlotte Brontë and the fifth of six children. In 1824, the family moved to Haworth, where Emily's father was perpetual curate, and it was in these surroundings that their literary oddities flourished. In childhood, after the death of their mother, the three sisters and their brother Patrick Branwell Brontë created imaginary lands, which were featured in stories they wrote. Little of Emily's work from this period survived, except for poems spoken by characters ("The Brontës' Web of Childhood", Fannie Ratchford, 1941). In 1842, Emily commenced work as a governess at Miss Patchett's Ladies Academy at Law Hill School, near Halifax, leaving after about six months due to homesickness. Later, with her sister Charlotte, she attended a private school in Brussels run by Constantin Heger and his wife, Claire Zoé Parent Heger. They later tried to open up a school at their home, but had no pupils. It was the discovery of Emily's poetic talent by Charlotte that led her and her sisters to publish a joint collection of their poetry in 1846, "Poems by Currer, Ellis, and Acton Bell". To evade contemporary prejudice against female writers, the Brontë sisters adopted androgynous first names. All three retained the first letter of their first names: Charlotte became Currer Bell, Anne became Acton Bell, and Emily became Ellis Bell.In 1847, she published her only novel, "Wuthering Heights", as two volumes of a three volume set (the last volume being "Agnes Grey" by her sister Anne). Its innovative structure somewhat puzzled critics. Although it received mixed reviews when it first came out, the book subsequently became an English literary classic. In 1850, Charlotte edited and published "Wuthering Heights" as a stand-alone novel and under Emily's real name. One of Emily's biographers Juliet Barker has claimed that Charlotte destroyed the manuscript of a second novel following her death. Emily's health, like her sisters', had been weakened by the harsh local climate at home and at school. She caught a cold during the funeral of her brother in September which led to tuberculosis. Consequently, having refused all medical help, she died on 19 December 1848 at about two in the afternoon. She was interred in the Church of St. Michael and All Angels family capsule, Haworth, West Yorkshire, England. Emily Brontë is popularly regarded as the epitome of the talented writer who died after a short blaze of genius, more so than either of her sisters. Allusions to her in popular works are frequent. The Hollywood film "Devotion", filmed in 1943 but not released until 1946, was a loosely historical biography of the sisters, with Emily portrayed by Ida Lupino and Charlotte by Olivia de Havilland. In the 1967 film "Week End" by Jean-Luc Godard, Emily Brontë appears in a scene in which one of the main characters asks her for directions. "The Spanish Inquisition", an episode of "Monty Python's Flying Circus", featured a sketch named "The Semaphore Version of "Wuthering Heights", in which the two main characters communicated from separate hilltops using semaphore flags. Kate Bush wrote a song named "Wuthering Heights", named for and based on Emily's novel. It was released in 1979 and hit #1 in the United Kingdom. In the video game "", one of the levels is called "Weathering Heights", in a reference to the book "Wuthering Heights". "Wuthering Heights" is referenced and quoted by various characters throughout Stephenie Meyer's "Twilight" series, particularly "Eclipse". One of the relevant places in the cartoon "The Grim Adventures of Billy & Mandy" is an asylum named "Withering Heights", once more a pun on "Wuthering Heights". * "Emily Brontë. Her Life and Work", Muriel Spark and Derek Stanford (1953).